1 of 5 In a large resealable plastic bag, combine apple juice concentrate, cider vinegar, pumpkin pie spice and 1/4 teaspoon of salt. Add chicken; shake to coat. Refrigerate for at least 1 hour. 2 of 5 Heat oven to 375 degrees F. Place a rack in a roasting pan and spray with nonstick cooking spray. Remove the chicken from the marinade and reserve the marinade. Place the chicken in the roasting pan and season with the remaining 1/4 teaspoon salt and the pepper. Roast for 50 to 60 minutes or until the internal temperature reads 170 degrees F on an instant-read thermometer. Baste with marinade twice during cooking. 3 of 5 Heat a large nonstick skillet over medium-high heat. Spray with nonstick cooking spray. Add apples; saute for 6 minutes, turning apples halfway through cooking. Remove apples to a plate and keep warm. 4 of 5 Wipe out the skillet and add the marinade. Bring to a simmer. In a medium bowl, whisk together the half-and-half, flour and Dijon mustard. Gradually whisk in the heated apple juice concentrate mixture. Return mixture to the skillet and simmer for an additional minute. 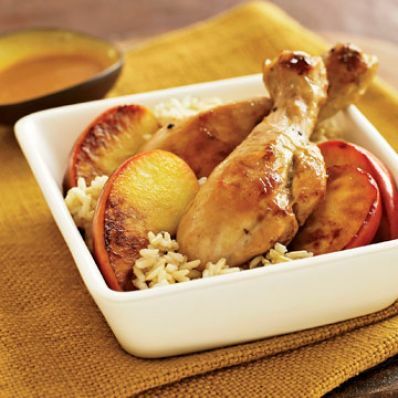 5 of 5 Serve the chicken with the apples, brown rice and sauce.